Demands for justice rang loud in Brazil on the morning of June 19, as nearly 2,000 civilians marched through the upscale Urca neighborhood of Rio de Janeiro. These protestors form a part of the “Movimento Escracho,” which derives its name from a word denoting severe criticism. Participants donned painted faces and brandished imposing signs that read, “For memory, truth, and justice.” Their fiery protests denounced former Army Captain Dulene Aleixo Garcez dos Reis, who served during the military dictatorship of 1964-85 as a torturer. Such scenes are all too familiar throughout the world. Many states have developed amnesia regarding past human rights violations on the part of their governments. In the face of development, justice gets sidetracked, and high-ranking officials revel in unchecked impunity. It is up to citizens to demand justice from their governments. The question remains, however, to what extent does reopening past cases aid or hinder efforts toward national progress? Under the 1995-2002 Cardoso regime, the Comissão Especial sobre Mortos e Desaparecidos Políticos (Special Commission on Political Deaths and Disappearances) was instituted as a remedy to these state crimes. It called for the Brazilian government to take full responsibility for the investigations of murders and disappearances of those who have participated or been accused of involvement in political activities between September 2, 1961 and October 5, 1988. The Rousseff administration has also recently announced the formation of the Comissão da Verdade (Truth Commission). This investigative entity will be responsible for prosecuting human rights violations committed between 1946 and 1988. To this end, post-dictatorship governments in Brazil have at the very least offered nominal support to victims of state-sanctioned abuse. Several administrations have exposed past injustices and, despite undeniable inefficiencies, prosecuted some offenses. 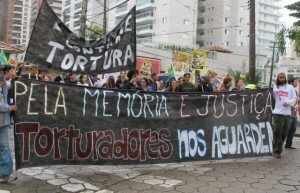 A report released by the U.N. Subcommittee on Prevention and Torture on June 14, however, affirms the protestors’ grievances in Rio. According to the report, a culture that accepts military crimes persists in Brazil. Accountability severely diminishes as one scales the socio-economic and political hierarchy, and many Brazilians have simply had their fill. The Movimento Escracho is admirable for shedding light on ex-military officials who have generally shied away from public life. 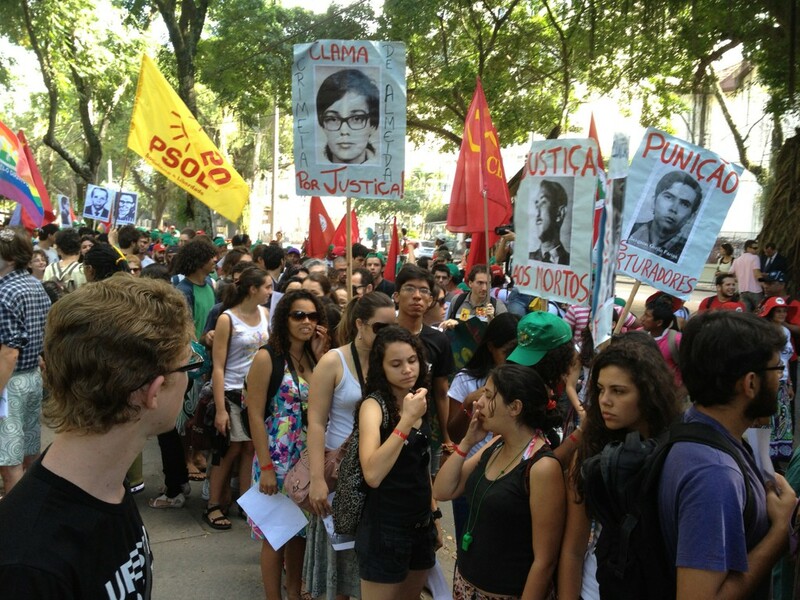 The majority of activists are young university students condemning older, upper-class individuals. Generally speaking, participants in the Movimento Escracho have made commendable efforts to expose corruption in past administrations and pressure the state to end impunity. The case of former Captain Garcez deals specifically with the torture of journalists and Secretary General of the Revolutionary Brazilian Communist Party Mario Alves, whose views directly contrasted those of the right-wing dictatorship. Similar to many of his former military counterparts, Garcez currently lives a relatively quiet life, sans any investigations or trials regarding his past human rights offenses. The impunity he has enjoyed since the fall of the dictatorship is reflective of flaws in Brazil’s democratic system, and its failure to meet many citizens’ demands for justice. The amnesty law passed in 1979, which exonerates military officials who have perpetrated torture and human rights violations during the dictatorship, has sparked controversy regarding these very demands. Movements like the Movimento Escracho are of the utmost value for a nation with such high geopolitical prospects. Recent news has placed Brazil among the leading global powers, and much attention has been given to its preparations for the 2014 World Cup and 2016 Summer Olympics. In the face of such momentous events, many disregard the country’s societal ails. Despite its advances, however, the Brazilian government must tend to these sores in its history. Unaddressed instances of torture call the legitimacy of the Brazilian justice system into question. To prosecute crimes committed during the military dictatorship is in no way counterproductive for Brazil’s development; rather, it fulfills the state’s responsibilities to its citizens. The Partido dos Trabalhadores (PT), the ruling party in Brazil, has even released official statements to this cause. More specifically, the PT plans to fortify truth committees and mobilize younger generations in defense of justice. As incidents similar to the events on June 19 spring up nationwide, government officials ought to pay close attention. There is great potential for the current administration to secure support among its constituency by prosecuting perpetrators of the military dictatorship who remain untried. Furthermore, Brazil may very well evolve into a vanguard of justice in Latin America, especially as nations such as Guatemala are pressured to hold their own civil-war criminals accountable for past abuses of power. Marcco Antonio Martoins, “ONG faz protesto contra suposto torturador na zona sul do Rio,” Folha de Sao Paulo, last modified June 19, 2012, accessed June 21, 2012, http://www1.folha.uol.com.br/poder/1106939-ong-faz-protesto-contra-suposto-torturador-na-zona-sul-do-rio.shtml. “Comissão Especial sobre Mortos e Desaparecidos Políticos,” Secretaria Especial dos Direitos Humanos, accessed June 21, 2012, http://portal.mj.gov.br/sedh/ct/desaparecidos/abert_desaparecidos.htm. Daniella Jinkings, “Impunidade por atos de tortura está disseminada no Brasil,” Carta Capital, last modified June 14, 2012, last accessed June 21, 2012, http://www.cartacapital.com.br/sociedade/impunidade-por-atos-de-tortura-esta-disseminada-no-brasil/#todos-comentarios. “Juventude esculacha ex-torturador Dulene Aleixo Garcez dos Reis,” Vermelho, last modified June 19, 2012, last accessed June 22, 2012, http://www.vermelho.org.br/noticia.php?id_noticia=186235&id_secao=8. Brazilian Aviation Crisis – Mechanical Error Or Governmental Failure? Or a Metaphor for Brazil Under Lula’s Rule? August 21, 2007 COHA Comments Off on Brazilian Aviation Crisis – Mechanical Error Or Governmental Failure? Or a Metaphor for Brazil Under Lula’s Rule? October 30, 2008 COHA Comments Off on Disputa geopolítica Chávez vs. EE.UU.